Each section will explore indicators from Twitter and Facebook to determine the level of support for Tun Mahathir, PM Najib and political parties. This study was originally published on our Facebook Page on May 9th, 2018. Additionally the Council, its members, the security forces or personnel of Government entities are protected from legal action. The combination of a lack of accountability and enforcement powers given to the PM were highlighted by the Opposition and civil society members. Following the passing of the bill on December 4th , the #TakNakDiktator campaign on December 8th . The goal of the campaign is to spread awareness of the issue and stop the bill from being made into law. As of December 20th, 22,552 supporters have signed the online petition and 6,481 users have tweeted the #TakNakDiktator hashtag. On August 3rd 2015 the Malaysian Anti-Corruption Commission (MACC) released a statement saying that the alleged transfers of RM2.6 billion into Prime Minister Najib Razak’s personal account came from donors and not 1MDB (link1 , link2). This prompted a strong response on Twitter as users started to tweet about Najib and derma (donations). 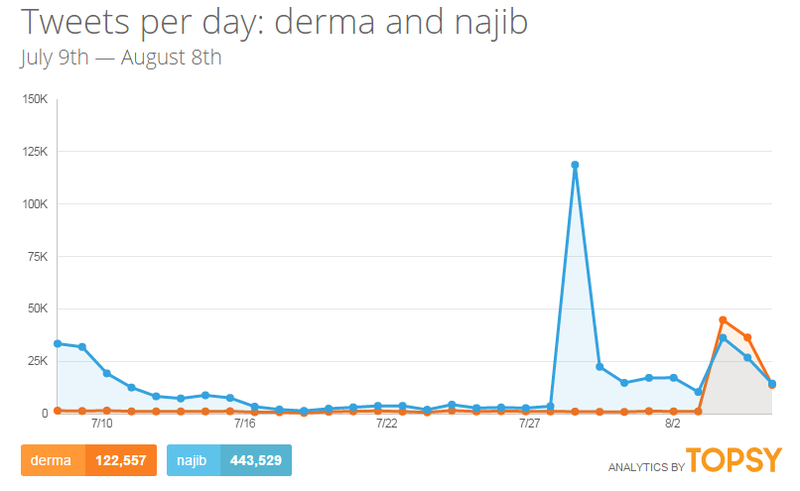 We collected 193,893 tweets from 79,949 users about donations (derma) and Najib from August 3rd – August 6th. To get a sense of the scale, here is the graph for mentions of Najib and donations per day within the past 30 days. On July 28th 2015 a new Cabinet line-up was announced by Malaysia’s Prime Minister Najib Razak. Former Deputy Prime Minister Tan Sri Muhyiddin Yassin was absent from the new Cabinet. Zaid Hamidi replaced him for the post of Deputy Prime Minister and Mahdzir Khalid replaced him for the post of Minister of Education. Muhyiddin being dropped from the Cabinet followed speculation that this would happen due to his remarks about 1MDB on Sunday, July 26th. He was reported to have asked for PM Najib to personally explain the 1MDB issue and answer the allegations by the Wall Street Journal (WSJ) . We performed opinion-based analysis on 502 users based in Malaysia who tweeted about Muhyiddin and related terms on July 28th 2015. The margin of error is +/- 4.37%. Users were selected based on their tweet content and activity during this period. Sampling was done per-state based on the current estimated user population. Spammers, news agencies and accounts with automated tweets were not included in the sample. From this dataset we analysed the individual Twitter user timelines to determine their opinion. This took their tweets, retweets and conversations into account. Our goal was to gauge public reaction by Twitter users in Malaysia to the removal of Tan Sri Muhyiddin Yassin to see if they supported the decision. Users who were tweeting about related topics (PM Najib; the Cabinet line-up) but not in response to Muhyiddin Yassin’s dismissal were not included in the sample. However we took note of what these users were saying for section 4 (Additional Opinions). The results are shown in the following charts. On July 28th 2015 a new Cabinet line-up was announced by Malaysia’s Prime Minister Najib Razak (PM Najib). Former Deputy Prime Minister Muhyiddin Yassin was absent from the new Cabinet. Zaid Hamidi replaced him for the post of Deputy Prime Minister and Mahdzir Khalid replaced him for the post of Minister of Education. Muhyiddin being dropped from the Cabinet followed speculation that this would happen due to his remarks about 1MDB on Sunday, July 26th. He was reported to have asked for PM Najib to personally explain the 1MDB issue and answer the allegations by the Wall Street Journal (WSJ) (reference). On July 3rd 2015 at 4.42 AM (GMT+8), The Wall Street Journal (WSJ) published an article alleging that the on-going investigation into 1Malaysia Development Berhad (1MDB) found evidence of billions of ringgit being transferred into Prime Minister Najib Razak’s personal bank accounts at AmIslamic Bank . This was followed by a more detailed expose by Sarawak Report tweeted at 5.20 AM that provided unverified details on the dates, account numbers and sums of money involved . News of the expose started to spread online at 9 AM. From what we observed, WSJ carrying the story added credibility to the claims despite having no evidence attached to the article. The Prime Minister responded with a press statement stating that he had ‘never taken funds for personal gain’ and the allegations came with no evidence . WSJ has stood by their claims . Over the next few days online backlash against the PM continued to increase. The publication of allegations by WSJ served as a trigger for an outpouring of criticism towards the PM on many issues beyond the alleged theft. We performed opinion-based analysis on 600 users based in Malaysia who tweeted about Najib, @NajibRazak, 1MDB, WSJ, Sarawak Report and related terms from July 3rd – July 7th 2015. The margin of error is +/- 4%. Our goal was to gauge public reaction by Twitter users in Malaysia to the allegations raised by the Wall Street Journal and Sarawak Report. Users who were tweeting about PM Najib but not in response to the issues raised (transfer of funds from 1MDB) were not included in the sample. A dialogue between Malaysia’s Prime Minister Najib Razak and non-government organisations (NGO) was scheduled to be held at PWTC on Friday, June 5th 2015 (9 am – 11 am) . The event was organised by the Malaysian Volunteer Lawyers Association (SukaGuam) and titled, #Nothing2Hide. Former Prime Minister Tun Dr. Mahathir was also expected to attend . Minutes before the event was due to start, the IGP announced that the event was cancelled to ensure public order . Despite that the audience stayed on even after confirmation that the PM would not be attending . Rumours started circulating on Twitter that the PM was ‘scared’ of Tun Dr.Mahathir, who took to the stage at 10.33 AM . Minutes later, the police asked him to stop and prevented him from continuing. This sparked further outrage online. At 5.17 PM, Najib Razak tweeted a statement saying that he was ready to have a dialogue with NGOs provided it was held in a peaceful environment . Remarks about Najib Razak and #Nothing2Hide continued over the next few days. We performed opinion-based analysis on 1000 users based in Malaysia who tweeted about the #Nothing2Hide event, Najib Razak and related terms from June 5th – June 8th 2015. The margin of error is +/- 3.1%. Our goal was to gauge the response by users in Malaysia to the Prime Minister not showing up at the event. We focused our analysis on their opinion of the PM and their general response to his absence at the event. Opinions about Tun Dr. Mahathir were not included as part of the detailed analysis.